"Ok, whole food supplements sound great! But where do I start?" Start with your body's filtration system. Liver & Kidney Cleanse is a special formulation of essential nutrients, herbs, minerals, and enzymes to naturally eliminates toxins trapped in the liver kidneys to improve the body’s filtration system. One bottle, two capsules at bedtime - no harsh side effects, no need to stay close to a bathroom. This cleanse can be done once or twice a year for 30 days. At $24.95 a bottle, it's cheaper than changing the filters on your car. They are similar to the filters in the car, air-conditioning system, and clothes dryer. They all need to be cleansed on a regular basis, yet how often do people think about the most important filters in life, the body’s filters? The liver has over 600 functions that are crucial for the body to sustain itself. One of the liver and kidneys responsibilities is to rid the body of all the toxins. These organs can only function properly when they are kept clean and provided with essential nutrients. 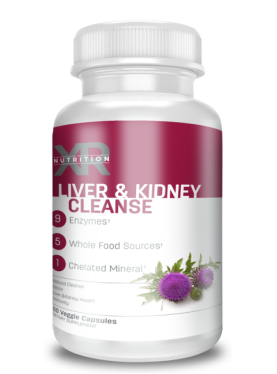 XR Nutrition's approach in cleansing and supporting the liver and kidneys is a simple blend of key ingredients that have the ability to naturally cleanse these organs while simultaneously building and fortifying these organs without the side effects often associated with other cleanses. As a result, this supplement stands out to those looking for a safe and natural liver and kidney detoxifier. Liver & Kidney Cleanse is also recommended for anyone experiencing any of the following conditions: chronic medication use, alcohol use, tobacco use, drug use, high cholesterol, cirrhosis, hepatitis, constipation, acne, and other skin disorders. 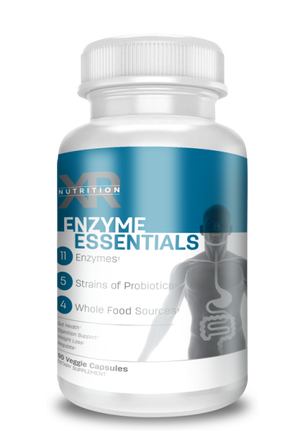 Enzyme Essentials + Probiotics provides all of the nutrients needed for proper digestion, including plant-based enzymes and minerals that break food down into useable constituents and friendly bacteria to be assimilated into the bloodstream. ​As research shows, an enzyme-deficient diet is not much better than starvation. Fight back with XR Nutrition's Enzyme Essentials + Probiotic formula and feel the benefits of true digestion today. ​This formula ensures that what is consumed is properly utilized by the body at the cellular level. Enzymes released by the pancreas are the driving force in the human digestive system; therefore, Enzyme Essentials + Probiotics simply restores into the diet the enzymes that were killed during the cooking process. Without enzymes, the body may be starving for nutrients. As a result, if the body’s digestion capabilities are compromised and unable to break down foods into useable energy, the body can experience conditions like bloating, decreased energy, premature aging, lowered immune response, and even weight gain. Fortunately, Digestion Essentials + Probiotics provides the body with all of the essential enzymes needed for proper digestion. It's not what you INGEST, it's what you DIGEST. If you're sick and tired of being sick and tired...this is the product for you! ​ Pure B Power has been created from a safe balance of natural B vitamins for immunity, mental and digestive health, and to promote healthy hair, skin, and nails. It provides a wealth of vitamins, minerals, and protein that almost anyone—from Paleo enthusiasts to vegans—can enjoy. 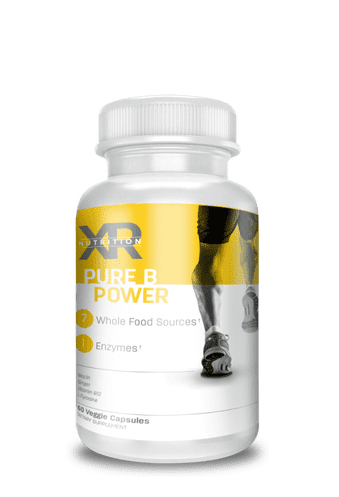 The nutrient heavy B vitamins that are found in Pure B Power have been shown to increase energy levels, metabolism, mental clarity, and decrease joint pain, blood sugar levels, and injury/recovery times. Never Run Out of Battery: Running on low energy? The B vitamin complex in this product allows the body and brain to work together to maintain a constant energy during your day. Multi Daily Multivitamin is an entirely natural, whole-food source of essential daily vitamins and minerals. This formula’s exclusive delivery system makes this supplement one of the most effective multivitamins on the market. This unique delivery system is equipped with all of the enzymes and cofactors necessary to guarantee thorough digestion and absorption of the supplement’s natural vitamins and minerals. All of the enzymes, cofactors, botanical compounds, vitamins, and minerals in this formula are entirely derived from whole foods. ​Supplement manufacturers like XR Nutrition, which produce their products from truly natural food sources, will confidently list on the label the actual whole-food sources of the vitamins. If the label on the bottle at the local store says that the vitamin C is derived from ascorbate or ascorbic acid, try searching for an ascorbic acid plant or fruit; no such tree/fruit exists. If the label reads, “Vitamin A as acetate or retinal palmitate,” remember that acetate and palmitate plants also don’t exist. Have confidence knowing that all of XR Nutrition's vitamins and minerals are truly from whole-food sources (e.g. vitamin C from oranges, acerola cherries, green peppers, and chickweed; vitamin E from wheat germ; vitamin A from carrots, alfalfa, wild yams, broccoli, spinach, and oranges). Digestion Cleanse is currently the most unique and effective formula on the market for naturally cleansing the bowel, removing unwanted toxins from the body, and restoring the mucosa lining throughout the intestinal tract. The mucosa membrane is composed of healthy bacteria called probiotics, or flora. This probiotic lining in our intestinal tract and stomach is constantly under attack by antibiotic abuse, stress, antacids, and carbonation. As the mucosa lining is weakened, the bad bacteria passes through the mucosa and creates inflammation in the stomach wall, commonly resulting in an ulcer. Other similar conditions, such as Ulcerative Colitis, IBS, inflammation of the bowels, and Crohn’s disease, can all be caused by a weakened mucosa lining. Digestion Cleanse formula is designed to be the first step in supporting all of these problems. The formula’s licorice root and psyllium bond together to form a base, upon which the healthy probiotics can be cultivated. Simultaneously, the glutamine adds support during the healing stages. 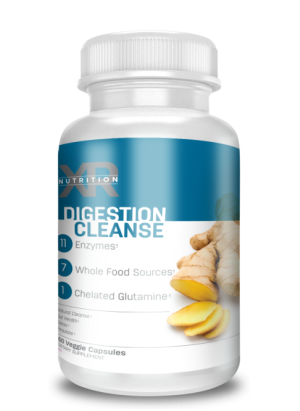 Digestion Cleanse also helps support and repair the intestinal lining. Additionally, it helps remove heavy metal toxins, add fiber to promote intestinal cleansing, and repair and prevent ulcers. Use our SYMPTOM CHECKER to provide supplement suggestions based on your personal challenges. Write down the XR Nutrition Solutions. ​Adrenal Balance: Designed to aid the adrenal glands for optimal function while providing key whole-food nutrients to support adrenal health. Antioxidant Pro: A highly effective combination of potent antioxidants to help boost the body’s ability to fight free radicals on a cellular level. Clarity: A natural blend of B vitamins combined with other key nutrients to fuel the brain and the body for power and mental clarity when the body needs it most. Digestion Cleanse: A versatile blend of whole food nutrients and stabilized probiotics to help clean and rebuild a stronger intestinal tract for improved immunity and digestion. Enzyme Essentials: A must-have blend of stabilized plant-based enzymes and probiotics to help support the body’s natural ability that digest, absorb, and metabolize nutrients safely and completely. Fat & Sugar Enzymes: A proprietary blend of highly purified enzymes that optimize the breakdown of fats, carbohydrates, sugars, starches and fats. Great for high cholesterol, food-related intolerances, hypoglycemia and diabetes. Fruit & Veggie Essentials: A premium blend of 39 organic vegetables and fruits that have been freeze dried from Mother Nature’s garden. In each scoop, you may receive up to 12,000 ORAC units of antioxidants. Combine it with Protein+ to provide a healthy alternative for a meal. Immune Response: Powerful support the immune system to help fight illness, flu like symptoms, and infection among many others. Inflammation Relief: A rare and unique blend of stabilized plant-based enzymes that may ease symptoms of allergies, reduce injury recovery times, improve circulation, provide pain management, and powerfully assist protein digestion. Joint Rebuild: Designed to help build and maintain joint strength, and aid to improve recovery time of joint injuries. Liver & Kidney Cleanse: A special formulation of essential nutrients, herbs, minerals, and enzymes to naturally eliminates toxins trapped in the liver kidneys to improve the body’s filtration system. Men’s Balance: A one-of-a-kind blend of whole food nutrients and key enzymes to aid men in brain function, prostate health, and performance. 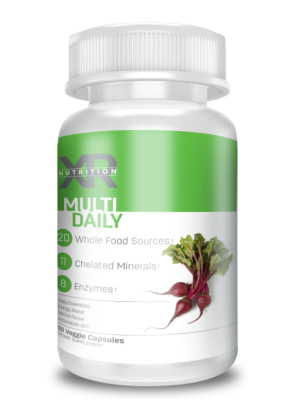 Multi Daily: Multi Daily separates itself from the rest of multi-vitamins on the market today. Blended with stabilized plant-based enzymes, whole food nutrients, antioxidants and chelated minerals to better absorbed and utilized on a cellular level. Nature’s Stomach Remedy Chewables: A tasty combination of chewable digestive enzymes and active probiotics that may help relieve heart burn, acid reflux and is safe for all ages. Omega Essentials: Pure sources of Omega 3, 6, and 9 which, may not only help reduce cholesterol and joint pain, but also improve muscle recovery, brain function, and hair and skin health. Osteo Build: Created with plant-based nutrients and minerals to help assist in building, repairing and maintain healthy bone density. pH Pro: An alkaline formula designed to help increase oxygen utilization on a cellular level. Probiotic Essentials + Prebiotics: A strong blend of prebiotic and probiotic strains that improve digestion and boost the immune system. Protein+ (Chocolate or Vanilla): Vegan, plant-based protein, a better way without the whey. Main protein sources include pea protein isolate, organic hemp protein, sacha inchi and chia seed. Clean protein, fats, and carbohydrates, 0g Sugar. Combine with Fruit & Veggie Essentials +Probiotics to provide a healthy meal replacement. Combine with Multi-Daily for a complete source of daily essentials. Pure B Power: Created to help fuel the body by providing a pure source of B vitamins for power and balance. Pure Iron: Highly absorbent, stomach gentle formula of chelated iron minerals that safely aids in the production of power, mental clarity and symptoms relating to anemia, headaches, migraines, and weakness. Pure Performance: A remarkable blend of highly absorbent, branch chain amino acids, chelated minerals, glutamine, and the right amount of creatine to build lean muscle, enhance recovery time, maintain muscle mass and improve active performance. Weight Loss Essentials: A combination of 4 key elements to aid in managing and maintaining a healthy weight loss by providing an effective appetite suppressant with a blend of plant-based enzymes for proper digestion and breakdown on fats. Woman’s Balance: Designed to balance the hormones in the body by combining essential blends of B vitamins, whole food nutrients and a complete mix of enzymes for absorption.